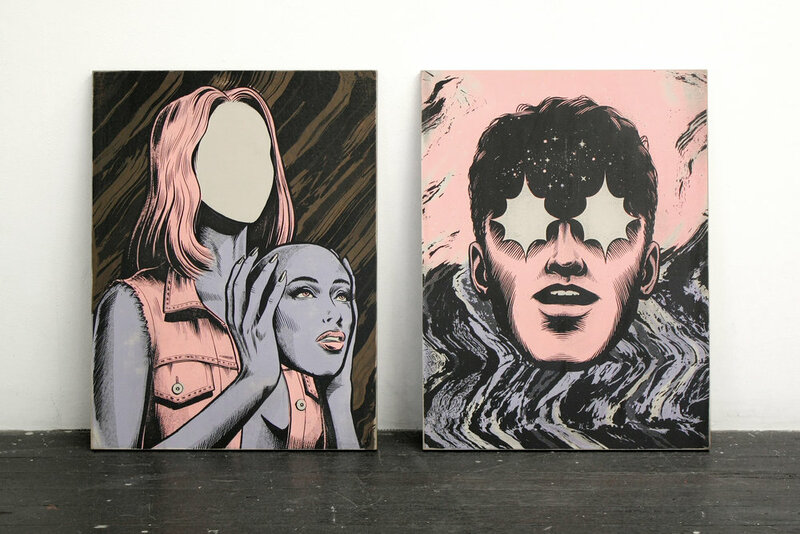 Sydney based illustrator and designer Andrew Fairclough’s first solo exhibition ‘Total Control’ features a collection of mixed media works on wood-panel, combining illustrative portraiture, painting and printmaking. The works explore themes of introspection, confusion, duality and impulse control viewed through the dead-gaze of technological distraction and the mesmerising flow of infinite information that is everywhere and nowhere at once. Inspired by dystopian fiction, mid-century illustration and low-brow comics, the resulting body of work constructs an uneasy yet hopeful atmosphere awash with abstract textural explorations and haphazard experiments. Working mostly under his professional moniker Kindred Studio, Andrew Fairclough is an illustrator, designer and art-director best known for his textural illustrative work and vintage print aesthetic. Having participated in multiple group shows since 2012, Total Control will be Andrew’s first solo exhibition. Opening: Friday 31st march, 6-8pm. China Heights, 16 Foster Street Surry Hills.